There's no arguing the fact that most fathers and their families are busy. Between work, household chores, homework, sports, extracurricular activities and social obligations, dads, moms and their kids don't have a lot of time to spend together, especially at night during the week. But experts say fathers should make eating family dinners together a priority, no matter how busy they, their spouses or their children are. Research has shown that kids who regularly sit down and eat with their families do better in school, have higher self-esteem and are less likely to drink, do drugs, get pregnant or be depressed. 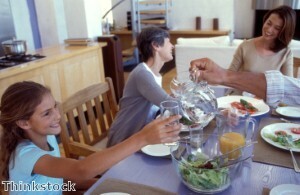 In addition, WebMD reports that families that dine together eat healthier and are less likely to be overweight. While it seems like a simple piece of parenting advice to tell fathers that they should sit down and eat dinner with their kids more often, making it happen can be a struggle for busy families. Experts say that dads should start by initially setting a goal to eat together one or two times per week. Planning healthy meals is important, but parents shouldn't be discouraged if they can't pull together a home-cooked meal. Take-out, frozen meals and going out to eat together are perfectly acceptable, according to The Family Dinner Project. What is important is setting time aside to be together without TV, phones and other distractions.